A journalist who spent four decades with the same weekly newspaper has died aged 80. Tributes have been paid to Pat Ashberry, who worked at the Boston Standard between 1955 and 1999. 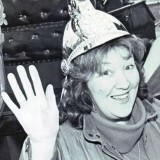 Initially a general reporter, Pat later moved into feature writing and her column ‘The Ashberry Angle’ ran for several years, focusing in particular on interesting and influential women in the Lincolnshire town. Pat died at Boston’s Pilgrim Hospital earlier this month, after suffering a stroke on New Year’s Eve. Current Standard editor Stephen Stray said: “I can recall first meeting Pat while completing work experience at the paper. I can remember how excited I was to meet ‘real-life reporters’. “This, of course, included Pat, who I shadowed on a number of assignments including trips to court, going out to meet people in their homes and a trek around May Fair, all of which ended with her taking me to Oldrids for a bottle of pop. “What struck me then, and remains with me to this day, was her ability to ask any question of anyone and get an answer. Former Standard editor George Wheatman first met a 17-year-old Pat while a junior reporter in the 1950s. Pat was originally from Blackheath, in the Black Country, before moving to take a junior reporter job with the Standard. While staying in ‘digs’ in the town, she met and married her landlady’s son Jeff. The couple had three sons – Simon, Tim and Jez – who were born while Pat took a break from journalism in the mid-1906s. Jeff died two years ago, also aged 80, but she is survived by her sons and six grandchildren. Pat’s funeral will be held at Boston Crematorium at 1.30pm on 30 January. I worked opposite Pat for six months while the Standard’s trainee sports reporter in the late 1990s. I remember her being very cool and calm in dealing with all kinds of people. She was always respectful and had time for those learning the trade. A wonderful lady and part of what was a great team at the Standard.